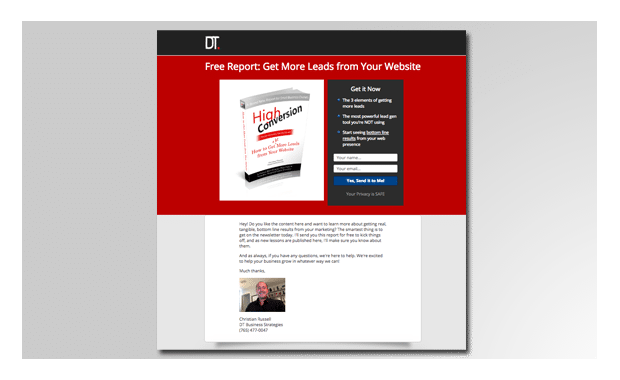 This type of lead gen page is far from new, but it has started to become more popular lately. The straight opt in is different than it’s younger sibling (the double opt in). Also called a “single opt in”, it simply means you put in your contact details, and you immediately get added to the email list and receive your free report or whatever it is you’re getting. In other words, there’s not a confirmation message that comes to your inbox that requires you to confirm your email address before completing the signup process. One step is faster and easier than two. This usually leads to a higher conversion rate. There are caveats to using this approach, and it’s not the right fit for everyone. But it can also be a tremendous way to build your pipeline…fast. Let’s jump on a call to discuss your goals and see what type of landing pages will best serve you. Every business is different, so a customized strategy is the best way to ensure you’re maximizing your results.